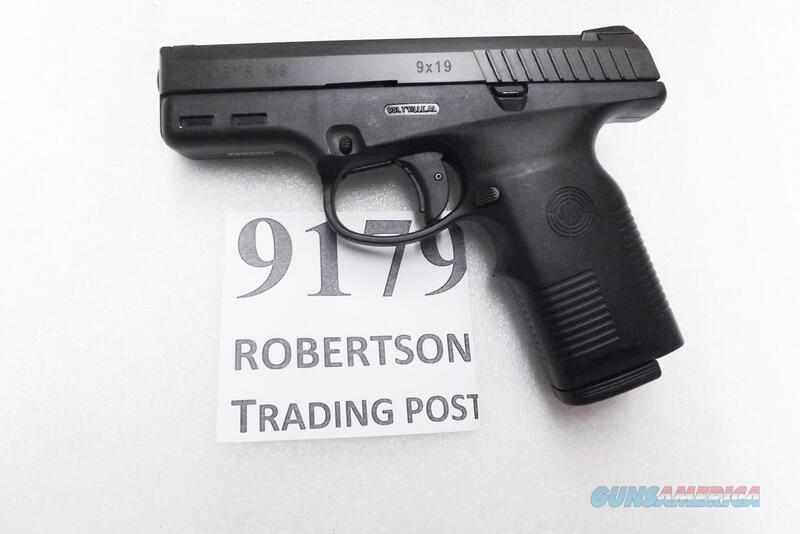 Description: This listing is for the exact pistol in the photos. Here is the Steyr M9 Pistol chambered in 9mm. Manufacturer was Steyr Mannlicher of St. Peter, Austria. From its date code, it was manufactured in 2001. Production on the First Generation M9 ran from 1998 until 2004. Initial importer on this piece was GSI of Trussville, AL; re-importer is stamped on the slide. Type is short recoil, striker fired locked breech semi automatic pistol, full time double action. Construction is forged steel barrel, milled steel slide, stamped steel internal parts built into a steel reinforced polymer frame. Barrel is 8 groove right hand conventional rifling, 1:9.84 inch twist. Chambering is 9mm Luger, 9mm Parabellum, 9x19, call it what you will, THE 9mm; and the Steyr will cycle any kind of 9mm ammunition, unlike many of its competitors. Slide is low positioned for diminished felt recoil, and has rear lateral serrations. Sights are dovetailed front and rear, distinctive trapezoidal or predator sights: triangular front and 45 degree positioned rear inlays. Frame is generation one European style with lateral rail slots only, not made for Picatinny. Grip frame is middle finger contours, with lateral serrations front and back. Takedown is right side lever type. Trigger is .400 polymer with center trigger safety bar; pulls at 6 pounds vicinity with only 4mm travel. The M9 has an internal lock that is set on unlocked position, keys are readily available from steyrarms com. It has a firing pin safety in addition to its trigger safety. Magazine is an LE marked 14 rounder, so 14+1 fully loaded capacity. Weight empty is only 27 ounces. Overall length is 7 inches, from the muzzle to the rear of the grip frame strut; height 5 inches from the bottom of the magazine to the top of the rear sight; 1.10 slide thickness and 1.167 maximum frame thickness. Metal finish is original factory Mannox matte black, 99 percent impervious to corrosives. Surface detractions are minimal, principally moderate holster buffing to the frame. We rate this pistol as Excellent Condition, 90 percent vicinity by our estimate, but photos ought to suffice for our distinguished shoppers to judge finish grade for themselves. We estimate this pistol has been fired fewer than 1,000 rounds for annual qualification, no rounds at all for a Steyr. Replacement pricing on the successor M9A1 is $575 on steyrarms com. We're offering the M9 in the photos, however, for only	$ 359.00. Not transferable to civilian residents of California or Massachusetts. Civilian buyers in jurisdictions where 14 round magazines are restricted will receive 10 rounsers. Includes Connecticut, District of Colombia, Hawaii, Maryland, New Jersey and New York.